With Screw Cap and Teflon Liner. 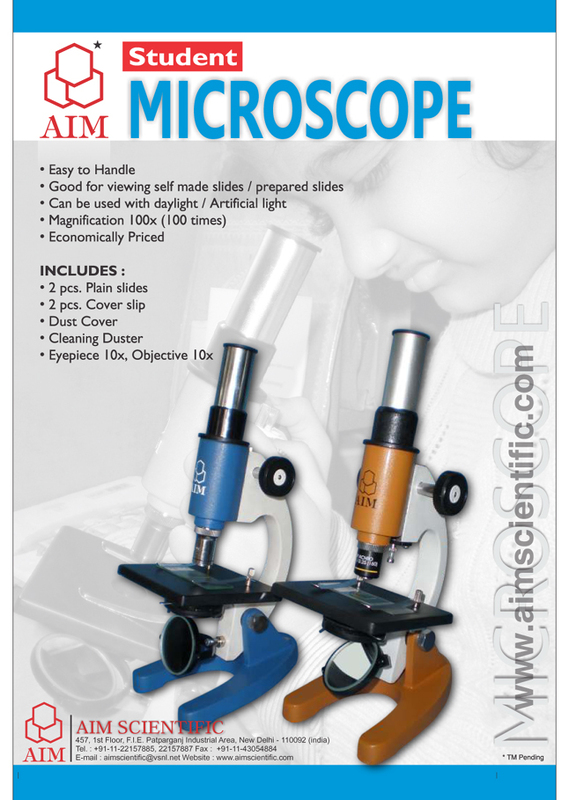 Available in Capacities Same as C/N G.105. Bottles Reagent, Wide Mouth with Interchangeable Stopper. Bottles Reagent Wide Mouth With Screw Cap and Teflon Liner. Capacity Same as C/N G107. Bottles Reagent. Amber, Narrow Mouth with Stopper. Bottles Weighing with Interchangeable Stopper. 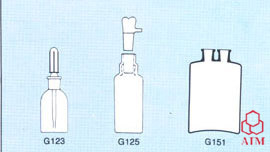 Bottles Weighing, Ground in Stopper, Capacity and Sizes same as C/N G115. 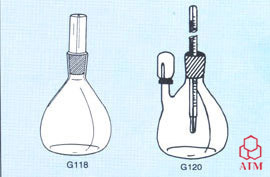 Bottles Specific Gravity with Capillary Bore Stopper. 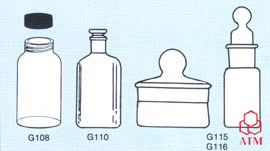 Specific Gravity Bottle with Ground in thermometer range 0 to 50 deg. C.
Dropping Bottle with Interchangeable Stopper and Rubber Teat. Dropping Bottle TK Pattern with Ground in Slotted Stopper, Clear Glass. Bottle Woulff, with 2 Necks. Bottle Woulff, with 3 Necks. Bottle, Culture, Plain Clear Glass with Aluminium Screw Cap with Rubber Liner.